Providing your guests with handmade wedding cards is a wonderful way to add a personal touch to your wedding. You can save on printing costs, and even buy a higher quality of paper with the reduced costs. We have compiled some recently submitted tips, to make affordable, handmade wedding cards to save on money–and add some love and uniqueness to your invites. Look below for some points of note. 1. Decide on the theme of your wedding in terms of tone and color scheme. This will not only determine the color and the texture of the card paper but also whether you’re going to go for a traditional, old fashioned look, or incorporate something more modern. The setting of your wedding factors in at this stage of the planning as well. 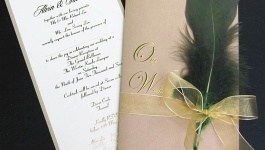 You want your handmade wedding cards to lend themselves to the overall theme of your upcoming wedding. Cards with an old fashioned look to them will sub-consciously lead your guests to feel like they’re invited to a more traditional ceremony. Handmade wedding cards with a brash “jump out and grab ya” kind of color scheme will make people think modern and flashy. Adjust according to your planned theme. 2. Try to write the invitations as a couple. This is a great way to bring the two of you together, closing in on the upcoming wedding day. Handmade wedding cards will give the two of you the chance to add relevant comments to specific people–so doing it together makes for two brains, instead of just one (it’s easy to forget details). If you need to call around to different relatives to confirm specific details, writing together also frees up one person to get on the phone (or Internet) and leave the other to continue on with the writing process, ensuring you get them done–instead of messing around going back and forth. 3. Determine what style of writing is best: Formal, or informal. I.e. Formal: “John and Brenda would like to ask that you attend our ceremony on our wedding day.” or Informal: “Come hang out with us at our wedding.”–handmade wedding cards give you the flexibility to alter and change plans on the fly. 4. Take your time. You are making handmade wedding cards likely to save money, but also to give your invites a special flare…don’t rush things, and make mistakes–or needlessly waste paper. 5. Place some 3D stickers on the front of your invites for added look and feel. There are a large variety of designs available from craft stores, that actually can look quite elegant and fresh. You would be surprised at the unique ideas these types of stores will give you when planning your handmade wedding cards. Purchasing these supplies online will give you even more selection, and cheaper deals on quantity buys.